I love being a blogger on social media because I get to try some of the coolest products and plants. This past spring, Burpee’s product selection team sent me a sample of their new Cupcake Summer Squash, an innovative hybrid of a zucchini and a squash. It has been a fun experience seeing it grow through the late spring and summer. The plant had been growing early on in a container in the dome and by mid-June I moved it to the raised bed in the dome growing directly in the soil where it would get a consistent watering. The beautiful plant has loads of flowers and I’m anxiously waiting to cook up Cupcake’s sweet flavor and soft skin makes for easy and tasty preparation. My plant is taking its time to produce I think mainly because I’ve had the plant growing in 2 different locations over the past 2 months and I’m also new to growing in the dome during the summer months. My friend Katie sent me some photos of her plant a one of the harvest that is featured below. Cupcake squash is new this year and growing in the dome. 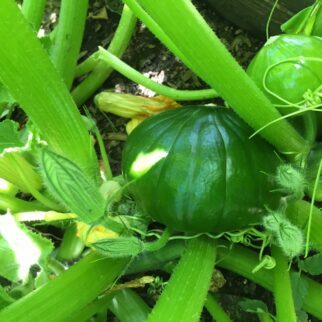 With it’s large, trailing plant yields dozens of round, green squash this is a recipe that can be served at the next dinner party. The veggie is a sweet flavor with zucchini’s soft skin. Slice off the top third portion of each squash. Scoop out the seeds. Steam lower portions cut side down and tops cut side up for about 5 mins. Remove tops and continue steaming squash bowls for another 2 to 3 minutes. Do not overcook. Mix remaining ingredients. Add flesh of three tops and reserve 1 tablespoon of breadbrumbs. Fill squash bowls with mixture and sprinkle with reserved breadcrumbs. This is most likely the easiest vegetable to grow in most any home garden. With this variety, you get a few squashes ready to use at one time on a somewhat medium size plant. 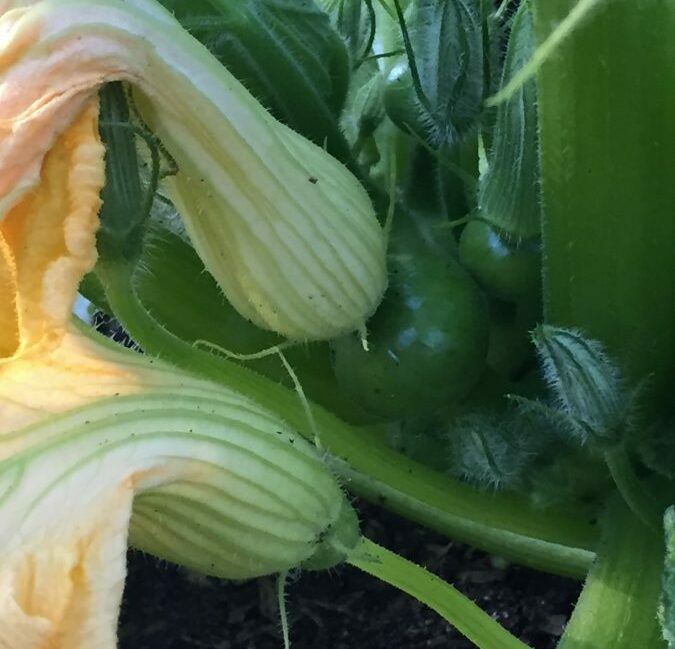 In the video below watch details on how they plant grows and will introduce you to some great recipes to use with this squash. 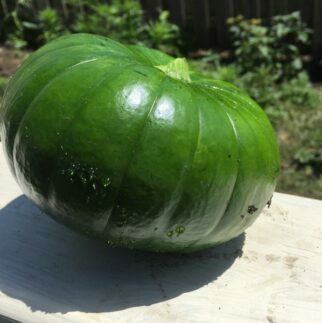 I’m excited to share that Burpee’s Cupcake Squash will be available in stores for 2017 which is great news because I can’t wait to grow this variety again! [alert-warning]Are you a fan of squash? Do you grow your own? I would love to hear from you so please comment in the space below so we can connect. I bought a couple of plants from my neighborhood Lowes and they are looking amazing. I have several squash and I can’t wait to stuff them with seafood. The plants and the flowers they produce are beautiful to look at as well. Super yummy recipe… I can’t wait to try this with other varieties as well. I will keep you posted. Thank you for stopping by my site. I’m wondering if I mix in some crab meat what it’d taste like? I’m going to try it and I’ll let you know how it tastes. sound amazing… YES!!!! Stop back and tell me how it tastes. We did that. It’s awesome! Thank you for sharing this with me Ginger! These are amazing squash! The prolifically produce and root themselves wherever they touch the ground. Thus if part of the plant gets attacked by squash “vermin” the rest of the plant will carry on! 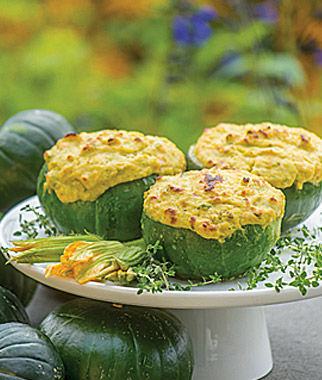 These little squash are great for grilling. Just brush with a little olive oil and sprinkle with a bit of salt and pepper.. Yummy! I use them for squash casseroles too…superb! My yellow squash and zucchini gave up a while back, but these little angels are still producing! Thank you for sharing this information with me Donna.